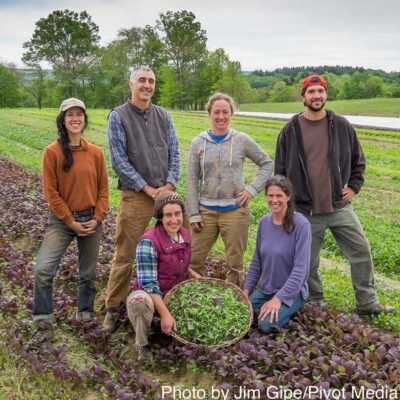 Casey (2nd from left, standing) and Missy (right, sitting) put their agricultural talents to work at Old Friends Farm, a beautiful organic farm up on a hill just one mile outside the center of Amherst, MA. In business since 2003, they are best-known for their top-quality salad greens and flowers. But they also produce a variety of other delicious foods, including garlic, ginger, turmeric, sweet potatoes, husk cherries, and onions. They have started a new line of specialty products too, including ginger syrup and dried turmeric and ginger powders and spice blends. Old Friends Farm’s certified organic offerings are sold to restaurants and natural foods stores in the area and can also be found at farmer’s markets in both western Massachusetts and the Boston area. At farmer’s market, their breathtaking flower arrangements make the Old Friends Farm booth easy to pick out! A particularly unique aspect of Old Friends Farm’s operation is their cultivation of fresh ginger, a crop traditionally grown only in much hotter regions of the world. Casey and Missy are pioneers in the production of fresh ginger in the Northeast. With the help of USDA sustainable agriculture research grant funds, they have developed methods for growing organic ginger in a temperate climate without reliance on fossil fuels for heated greenhouses. Growing their ginger instead in unheated hoop houses during the hot summer season, they are able to produce delicious, high quality ginger for the Northeast without the significant carbon footprint of ginger imported from the tropics. We are now buying all of our ginger from Old Friends Farm to include in our Organic Ginger Carrots and Organic Kimchi. We are incredibly excited for this opportunity to use Northeast-grown ginger in our Real Pickles products!